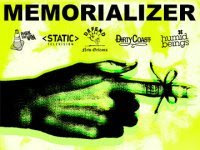 New Orleans Indie Rock Collective: Mem ... Mem ... Mem ... Memoralization! Mem ... Mem ... Mem ... Memoralization! Feeling lazy on this pre-Memorial Day Sunday? Come party at the Saint. Live music by Generationals, Carry the Wood (a Teeth cover band!) + DJ Drew Stubbs. There will be some BBQ, there will be some cocktail specials. And word on the street is that there will most likely be a big baby pool of friendship.